Classrooms need carpet space for the whole class to sit and learn during various activities. One challenge with this (besides finding space in your classroom) is getting kids to have their own space in a place where they can listen and learn best. 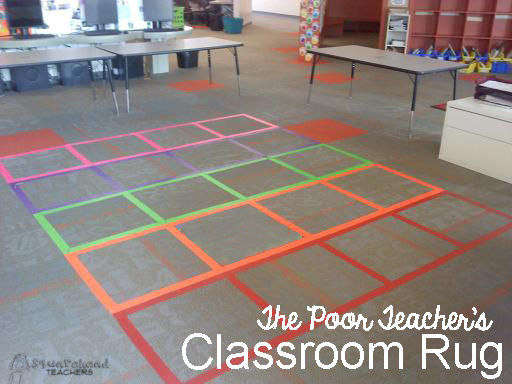 Many teachers have found it helpful to use a large rug with individual squares for each student. But what if your budget doesn’t allow for such a purchase? Let me introduce the poor teacher’s classroom carpet! Just go to the store and purchase different colors of duct tape and make one yourself! You can choose the colors, number of rows and size of each square. Be sure your school’s facilities policies allow the use of tape on the floor before doing this. This entry was posted in Beginning of the Year, Classroom & Decor, Management and tagged carpet, Children, classroom, Education, Elementary School, Kids, rug, Teacher Resources, Teachers, Teaching by Squarehead Teachers. Bookmark the permalink. I found that Velcro(or hook and loop tape -just the hook part) works great on the typical classroom carpet. I just order in large quantities and can find different colors as well. Its easy to change your mind and easy to take up at the end of the year. I have used the same piece a few years in a row.. No sticky stuff left on the carpet! Large quantities meaning in 25 foot rolls..